On this first day of summer, I want to celebrate some of my favorite summertime flavors. Strawberries are perhaps my favorite fruit of all time, going way back to my childhood days on my grandparents’ farm. My mom’s folks had long retired from dairy farming when I was a kid, but continued living on the farm for more than a decade. During that time, they rented out the pastures across from the farmhouse to a strawberry farmer who operated a Pick Your Own operation. Part of the lease deal was that my grand folks got as may strawberries as they could eat! Every summer, I stayed a week with them, usually overlapping with several of my two dozen cousins. Every morning, Grandma Cooper would send us over to collect a quart or two of those ruby drops of sunshine for her to turn into strawberry shortcake or strawberry rhubarb pie, my two favorite of her desserts. Probably an hour later (keep in mind we were only picking a couple quarts from vines bursting with fruit) we’d come back with barely enough berries in our bowls for her purposes, fingers and lips stained red. And when she asked us what took us so long we’d offer some story about picked over rows with scant berries, even though we knew she knew we were lying. “I think you eat more than you put in the bowl,” she’d say, taking our morning’s pickings into the kitchen to be transformed. Those summers are precious to me now the I know how few of them there would ever be, and that once past, they are gone except for my memories. But I think of them every time I sneak a strawberry to my lips as I prepare my Margarita Strawberry Shortcake or this frosty concoction. Even though I’m an adult and they’re my strawberries to do with as I please, I feel a twinge of guilt left over from those golden mornings in the field across from my Grandma’s porch. Strawberries are still plentiful on this first day of summer, and this frozen treat is a tribute to the passing of the summer solstice. The sweetness of the fruit balance the tart citrusy notes of a good New Zealand Sauvignon Blanc. And you DO NOT NEED AN ICE CREAM MACHINE!!! A machine will make short work of this easy-to-freeze treat, but you can just as easily freeze it in a 9×11 (or other such size) cake pan and fluff it with a fork several times as it freezes until it’s a frosty mound of goodness. The wine keeps it from freezing solid, so it stays playable and scoop-able whichever way you choose to go. Wash and hull the strawberries, and cut them in half. In a bowl, combine the strawberries and sugar. Let sit at room temperature to get the juices flowing. In a blender or food processor, combine the strawberry mixture, half the wine, a pinch of salt and the lime juice. Blend until very smooth. Add the rest of the wine. Transfer to a plastic quart container with a tight fitting lid and chill in the fridge thoroughly. Freeze according to your ice cream machine’s instructions. This will set up faster than regular ice creams. The consistency out of the ice cream machine will be like a very thick frozen drink. Transfer to a container and freeze in the freezer for at least 2-3 hours. 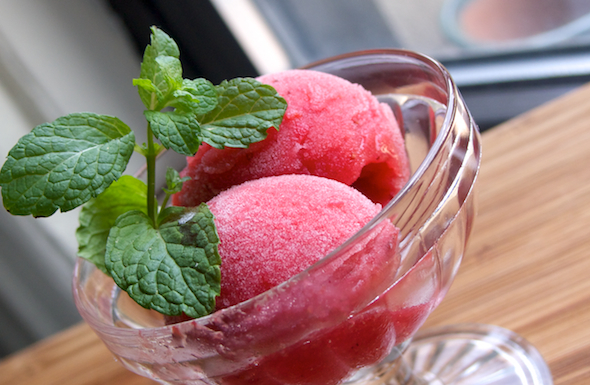 In the freezer it will take on the creamy smooth scoopability of sorbet. The wine actually contributes to the consistency by keeping it from freezing really hard, which can be a problem with fruit sorbets. Just one more reason why a tablespoon or two of liquor can radically improve any fruit sorbet recipe! If you don’t have an ice cream machine, you can easily pour this into a 9×11 inch pyrex baking dish and put it into the freezer for an hour. Take it out and use a fork to scrape the frozen crystals to the center. Do this every hour (about 2-3 more times) using the fork to scrape and fluff the sorbet as it sets. The wine keeps it from freezing solid, so this process is pretty easy. Once frozen, transfer to a plastic quart container with a tight fitting lid. Love those memories! Just Sunday I was reliving the warm, shiny red berry to the lips story with my Uncle John. NOTHING compares to that! Thanks for sharing this recipe as we will most definitely try it for this weekend.